This amazing sculpture is in the Paolo Orsi Museum in Syracuse (Siracusa, Sicily). It's made of limestone, and was in 936 pieces when found, by workmen digging foundations for one of the petrochemical installations just south of the site of Megara Hyblaea, on the east coast of Sicily, a few miles north of Syracuse. 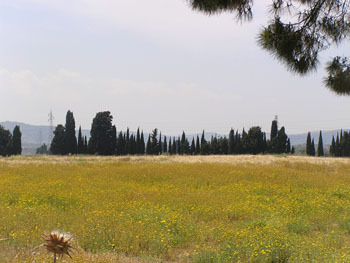 Here lay the necropolis (city of the dead, as still found mockingly mirroring the living city in many parts of southern Europe) of the small Greek colony (founded by Megarians from the Greek mainland in about 730 BC). Today - if you can find your way to the site through all the surrounding industry - you will be amazed at its peace and tranquillity, despite the stench of oil and smoke from the gleaming tanks and chimneys all around, and you are almost guaranteed to have the place to yourself. 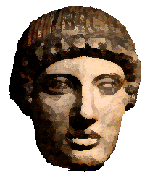 The sculpture was almost certainly a grave-marker (like most of the kouroi and korai from mainland Greece. Date probably around mid 6th century BC (a century after the foundation of the city). Beyond that - all is mystery. 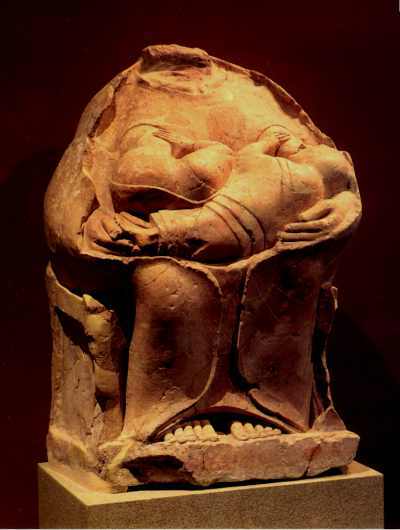 The unknown artist has created an image of motherhood which is tender and personal as well as monumental and archetypal. Look at the way she's holding the two babies - she's so relaxed, and the children are as comfortable as she is, each with a hand each gently holding on to a breast - both breasts being conveniently exposed through appropriate holes in her tunic. [Has any modern designer come up with as useful a nursing garment? - the "holes" would become slits when not in use, combining modesty and practicality!] The mother has her right hand with her thumb playfully stroking one baby's toes, while her left give's the other twin a little extra support for his head. But there is no tension anywhere: mother and children are so totally at ease and at peace with the world. Mother is in a chair with arms, sitting on her cloak which is outlining her and defining her. Her sturdy toes peep out beneath her tunic. Who is she? Some play safe and call her "a mother-goddess". I prefer Ross Holloway's conjecture ( Archaeology of Ancient Sicily ) - she is Night - hence the cloak, nursing her twin sons Sleep and Death (Hypnos and Thanatos): the twins who as young men carry off the corpse of Sarpedon in Iliad 16 . This would make it an entirely appropriate, and original, subject for a grave-marker. But the unknown artist has not produced merely an icon - he (or why not she?) has revealed a sensitivity to women and motherhood almost unknown in Greek Art. She's more than just a symbol - she's a real person, even without her head! Remember her when you look at the parade of "beautiful" women in sculpture or on vases, all tailored to the male gaze, fashionably slim, with expressionless faces, naked or artfully draped to accentuate what's concealed. The kourotrophos from Megara Hyblaea has a real figure and wears real clothes - and is the confident owner of her body. Jenny writes: "...And as for the Kourotrophos: no, sorry, it won't wash. She isn't in the least at ease with her own body; as a father and man of the world should know: she's pure male fantasy of maternal bliss. How could the poor thing possibly be peaceful with twins to feed? You must have talked with mothers of twins...... You're damned lucky if they ever sleep synchronised, let alone feed like that. Get real, Wilson!"